DISA, Wheelabrator, Italpresse Gauss, and StrikoWestofen are under the umbrella of the Norican Group. This is a clear acknowledgment for the foundry industry and the variety of materials and processes. How do you view the development in sand mould and light metal cast in the next 10 years? The automotive industry is the significant driver for key developments in sand moulding and light metal die casting. Within this industry, vehicle “light-weighting” is the dominant trend today to reduce CO2 emissions and create greater fuel efficiency. As a direct result of light-weighting, we expect that our customers will increase aluminium content within each car. Based on reports produced by the automotive industry itself, we would expect to see a 7-8% growth in the use of aluminium per car produced overall. According to Ducker Worldwide, aluminium will account for 19% of the material mix of a car by 2025. Our addition of aluminium parts formation technologies (melting, holding and dosing furnaces and high pressure, gravity and low pressure die casting technologies) is a direct result of this swing. It is a way to provide our customers with a wider choice of technologies to serve their end customers’ requirements. Ongoing consolidation of smaller foundries. We continue to see a shift from manual grey iron operations to high-pressure, automated moulding lines. We introduced the new DISA C3 automated vertical moulding lines last year specifically to help smaller foundries make this technology transition. Larger global companies demanding increased local presence. Our customers continue to demand higher level of service support for their facilities. In response to this requirement, suppliers (ourselves included) need to rethink how they prioritize their investments. Our approach, which has been further enhanced by the addition of the well-recognized and respected technology products of Italpresse Gauss and StrikoWestofen, has always been to deliver the aftermarket parts and service regionally. By adding more technology to the existing regional structure, we can provide assurances to our customers that no matter which technology platform they choose to use, we will always be there to support their choice, no matter where they operate. A need for continuous innovation: To ensure their own sustainability, our customers must continually bring new innovations to the market. They must constantly seek out innovative ways in which to reduce their costs per produced part while increasing production speeds. This requires business partners with both broad and deep technical experience. Suppliers who can help a customer (regardless of the metal being used) continuously improve their operation, while supplying world-class local support will be much sought after. It is with this in mind that the Norican Group has evolved the way it has. Urbanisation and global labour shortage: Our customers, whether they use green sand moulding or aluminium die casting technologies, are facing an unparalleled labour force challenge. The rise of the global information age has fundamentally changed the way the upcoming labour force views employment opportunities. Working in basic production environments is not at the top of the younger generations’ wish list for employment. Furthermore, there is a clear and undeniable trend towards urbanisation that stands in sharp contrast to the predominately rural co-ordinates of the world’s manufacturing locations. The shift from manual to automated production helps here, as does the development of knowledge-based solutions to augment the mechanical operations of the installed equipment. We can support our customers by making the traditional parts formation industries more “tech savvy”, more intelligent to appeal to the younger generation of workers. Emerging industry structural changes: Cutting across all our customers’ industries are the emerging opportunities arising from the increasing use of information to increase existing manufacturing productivity (“Industry 4.0”), and the increasingly viable 3D metal printing technology. The new brand portfolio makes Norican the largest supplier of foundry machinery worldwide. To what extent will Norican retain their traditionally strong brand and cultural characteristics in the future? Norican has always, and will continue to focus its technical innovation on the customers’ requirements. Our brands are the means with which we communicate this innovation to very specific customer segments. Therefore, it is not about us and our brands – it is about the customer. We want to provide our customers with a great customer experience, no matter who they are interacting with within our Group. We believe that doing this will make it easier for the customer to do business with us. What our customers value from us is a) our ability to provide quality, reliable products; b) our ability to support their operations locally; in a manner that c) improves their profitability. This is not complicated. Optimising this simple equation, though, is at the heart of everything we do. What does that mean for our customers? In Norican, they are getting a global industry view. The breadth and depth of our combined technical offering, combined with our deep knowledge of local operating conditions, allows us to provide unique operational insight for all our customers, regardless of the industries they are in. We aim to be a valued partner for our customers as they seek to upgrade their existing technologies, move into new technologies or establish footholds in geographic markets that they have not previously served. 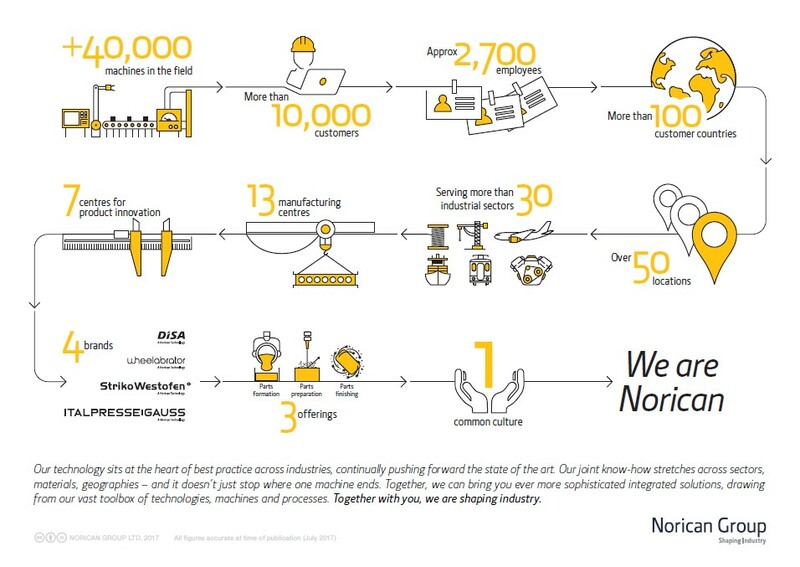 Over the long-term, the customer also receives the ongoing innovation pipeline from Norican. A pipeline based explicitly on improving their profitability. Our customers are very demanding and want to partner with suppliers who understand their needs, and can provide meaningful solutions that they have yet to think about. That’s our approach. Norican operates a single, global culture made up of one mission and four supporting core values. Our overarching mission is simple: “To create customer advocates by consistently exceeding their expectations”. Our four core values define how we interact with one another and provide the framework for us in achieving this unifying mission. a. Developing employee potential and excellence. Our people are the key to exceeding our customers’ expectations. We need to give them the means and tools to do this. b. Respecting and building on diversity and teamwork. We are a global company serving a global customer base. We value our broad internal national diversity (Danish, German, British, Indian, Chinese, Swiss, Italian, American, etc.) precisely because it is a mirror image of our customers. We believe this makes us a stronger partner for them and a better company overall as we marry this local perspective to the technology we offer. c. Delivering on commitments to all stakeholders. When we make a commitment, we fulfil it. Whether it is to our customers, our suppliers, our shareholders or to each other. Always. d. Leading for sustainability. We always take the long-term view when making internal decisions. Our goal is to exceed our customers’ expectations forever. We never jeopardise this view through actions that may be beneficial in the short-term at the expense of serving our customers over the long term. In terms of cultural differences, how central will communication be on various issues, target groups and markets? And how will customers benefit? As a global company, Norican uses a two-pronged approach for “making our value visible” to our customers. First, we listen to the needs of our customers. Our strategic regions provide a consistent “voice of the customer” (VOC) framework for this. This VOC defines our internal operating requirements for everything we do (innovation, customer service, order fulfilment, etc.). At the same time, our global product groups (parts formation, parts preparation, parts finishing) are developing technical responses to the innovation requirements, as well thinking about “over the horizon” issues which may affect our customers (like 3D printing, Industry 4.0). The global product groups drive the growth in the technology we offer and are responsible for industry-focused brand messaging (features and benefits, specifications, etc.). Our strategic regions control the regional application of that message (to accommodate local customers and language nuances) and for providing the local marketplace with an overview of all that Norican has to offer. Methods of communication have changed drastically over the past 10 years. We have to communicate in a way that is accessible to all our customers – from all sectors and all regions. Yet each user experience must be meaningful to that specific individual, not blasted out to a broad-based generic audience. We must create personal relationships if it is to be meaningful and enduring – it’s not B2B* or B2C*, it’s Human to Human. So as well as the traditional phone, letter or article in a magazine, we’ve moved to many more digital channels. We’re active (and interactive) on Twitter, Facebook, LinkedIn and YouTube. For our Chinese customers, we use WeChat and have another way to deliver video content. We have a blog at Wheelabrator that we’d like to expand to our other Norican technologies. Our monthly email news updates are really popular – we send out 12 different versions, presently, every month, to address the customer’s language/region/interest. Our recently launched website is by far our biggest communication tool. And again, it’s incredibly customer-oriented, it serves content in 16 different language/region versions – so that the customer is getting the info that is relevant to them. As we develop the content in the future, the Artificial Intelligence in the site’s make up will start to recognise you and your actions on-site to deliver new content that is relevant to your interests. While building the new website, we mapped out over 140 unique customer journeys. We wanted to know what the visitor wanted to get from the visit – Who is he/she? What content does he/she need? Where is he/she in the Buying Cycle? What info will he/she want next? Each page was audited to understand which persona was visiting the page and to answer these questions. From this understanding, we tailored specific information to appear, and provided the links or further content to take the user to the next stage – hopefully enriching the experience, and creating added-value. This is just one example of many where we are changing the way we interact with our customers with the goal of building enduring relationships. Of course, Human-to-Human communication has to happen in real life, as well as virtually! We’ve been holding more regional technical seminars to achieve a tailored and more personalised approach to “making the value visible”, and we’d like to welcome more customers to our Centres for Product Innovation, so they can see at first-hand what we’re up to, and can influence what we do next! In the age of foundry 4.0, research and development is even more important. With the strengths of the group, how will your brands benefit from this? It is not the brands that are looking for benefit per se, but the customer. As a company, we need to stay ahead of their requirements in this regard. We need to lead the field and be the foundry expert our customers demand. It is the only way we will help our customers remain sustainable. As mentioned earlier, there are two emerging opportunities within our customers’ industries: Industry 4.0 and 3D metal printing. For us to serve our customers better, we need to be aware of these emerging technologies and take a view on the best way to support our customers into the future. Overall, Foundry 4.0 or Industry 4.0 efforts are a huge opportunity for our customers. Being able to dramatically increase their throughput using less time and at a lower cost will appeal to everyone. Norican is in a unique position to provide a solution for this due to the nature of our end-to-end technical process view at a customer site. We have team members currently working on various aspects of a comprehensive offer that will allow a customer to connect disparate unit operations seamlessly with each other. Furthermore, we are looking into digital tools that will increase our customers’ profitability through the use of artificial intelligence, predictive and preventative maintenance analytics, product throughput statistics, energy optimisation, and so on. Industry 4.0 solutions will provide our customers with a potential answer to the changing labour force demographics. For example, we already offer remote monitoring services to iron foundry customers. This helps them augment already stretched employees with real-time application support. We see this as just the first step in a broader industry solution. Finally, we envision a world where our AI solutions will learn and continue to learn from a wide array of operating events, and different sequences of events, to drive predictive actions – like changing parts, or adapting programmes to avoid breakages and downtime. We feel that this will also drive innovation for ourselves and our customers as it helps identify key improvement opportunities. It is this ability to provide unique insight that will become the predominant determining factor when choosing a partner in the future. And we are planning for this today. The benefits of a standardised Industry 4.0 solution for our customers is enormous. Even small improvements of 1% increased throughput can make the difference between staying in business or being pushed aside by the flow of technology. The world of Industry 4.0 is rapidly growing around us, and we must maintain the pace to ensure our customers’ success. Up until now, the extent of the Norican family hasn’t been readily recognizable or openly advertised at trade fairs and events. When is the group expected to become involved in the combined corporate identity and when is reform at the management level expected to take place? We have never really pushed the Norican name - our customers have historically recognised us through our heritage technology brands. But now with so many brands under one roof we need to rethink this approach. Our focus has to be on the customer, and what he/she needs, as Norican, we have a wide range of technologies and solutions to choose from – to provide that “complete foundry” support. A key part of the value proposition we provide to our customers is our local sales & service organisation. We clearly cannot have a local sales & service organisation operating under four different brand names (not to mention any additional names we may pick up through future acquisitions). We therefore concluded that we actually need to “brand” the local sales & service organisations separately from the technology brands to communicate the essence of this unique and local value proposition. The “Norican Group” brand, therefore, is being introduced and positioned as a portfolio of world-class technologies being delivered and supported locally. At the same time, we will continue to promote technology portfolio brands, while linking them to the overall Norican family. Our branded technologies (DISA, Italpresse Gauss, StrikoWestofen and Wheelabrator) are the anchor for our business. We will continue to invest in their message of innovation while we build up our customers’ perception of the value we are delivering through our local sales and service offices. As importantly, we will explicitly link them together with a new tagline of “A Norican Technology”. This ties all our technologies to our sales and service regions with a simply understood message for the customer. In short, we will be more visible as Norican Group in the future. You will begin to see us roll out our new branding approach later this summer at various tradeshows throughout the world, with a goal of having our combined branding in place across all communication platforms (website, tradeshows, email addresses, signage, stationery letterhead, etc.) by the end of the year. This is an exciting year for us and our customers as we increase both the breadth and depth of our technology offer while strengthening our local product support capability.